The family of USN Korea Veteran has asked the PGR to stand a Flag Line at his services to be held at Green Hill Funeral Home Chapel at 3:00PM. Following the service the PGR has been asked to perform Military Honors at the Veterans Memorial Shelter in Green Hill Cemetery. Monday, 11 March 2019 was a cool and cloudy day. The PGR staged at the Green Hill Funeral Home Chapel to gently blowing flags that had been posted. A briefing was held covering the details of todays services. 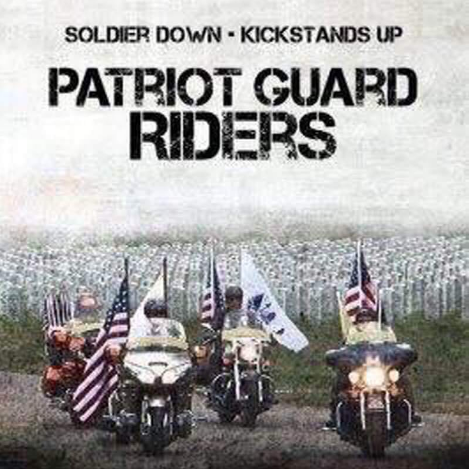 A prayer was given honoring Blue, Gold and Silver Star Mothers and families, blessings for the family, safety of all troops and first responders and safety for PGR riders. The front door was manned and the PGR stood a flag line as family and friends began to arrive. When the service began all flags were gathered and stowed for the next mission. The PGR moved from the chapel to the Veterans Committal Shelter across the cemetery. We were joined by another group of riders that had completed an earlier mission. At the conclusion of the services most of the family walked across the cemetery to the Committal Shelter that had been posted with flags. The PGR formed a Respect Line as Hero Mason was moved from the coach to the shelter by family members. The pastor presented a short service and then turned Military Honors over to the PGR. The PGR came forward and held the flag while Taps were played, the flag was then folded and presented to Mrs. Mason. The family was thanked for allowing the PGR the Honor of Standing for their/our Hero. The PGR plaque and Invocation Letter were read and also presented to Mrs. Mason. A “Final Salute” was given and participated in by all in attendance. The service was concluded, the PGR remained an appropriate time then flags were gathered and prepared for the next mission. Thank you, to the Mason family for inviting the PGR to be a part of this service to Honor this Hero. Thank you, to the PGR riders that took time to “Stand and Honor” this Hero, some of whom this was their second mission. “Rest in Peace” Tommy Mason, US Navy, Korea Veteran, your mission is complete, you are gone, but your service to this great Nation will never be forgotten.